We present here a household income percentile calculator for the United States for 2018. Enter a full, pre-tax household income earned between January and December 2017 to compare to household income percentiles in the full year. See also our math and methodology for household income brackets in the United States. Want more? See our individual income by age calculator and individual income calculator. Also see our net worth calculator and net worth by age calculator. The following graph shows the changes in cutoffs for selected household income brackets between 2018 and 2017. The numbers shown are not adjusted for inflation. Selected US Household Income Percentiles, 2018 vs. 2017 (Read: full previous years). What was Median Household Income in 2018? In the United States, the median household income was $61,822.00 in 2018. This encompassed income earned between January and December 2017. It is up from $58,849.00 in full-year 2016. What was Average Household Income in 2018? In the United States, the average household income was $86,599.91 in 2018. This encompassed income earned between January and December 2017. How Many US Households Made 6 Figures in 2018? Roughly 29.5% of US Households, or 37,665,335 American Households made a six-figure income in 2018 (at least $100,000.00). How Many US Households Make $250,000 or More in 2018? Around 4.3% of US Households, or 5,490,201 American Households made $250,000 or more in 2018. What were the Cutoffs for top 10% and top 5% Households in 2018? The top 10% of US Households made $178,793.00 or more in 2018 while the top 5% of households made $236,360.40 or more. What is the Cutoff to be a One-Percent Household in 2018? Although net worth is a better proxy for the 1% (see our one percent in America article), most often one-percenter refers to income. To reach the 1% in 2017, an American household would have to earn $434,454.80. Roughly 1,276,791 households made that or more for full year 2017. To top .5% of American households made a total income of $599,071.50. See the household income bracket article for details. There are no adjustments of screens on the data, all numbers provided are for the complete set of households in the ASEC. 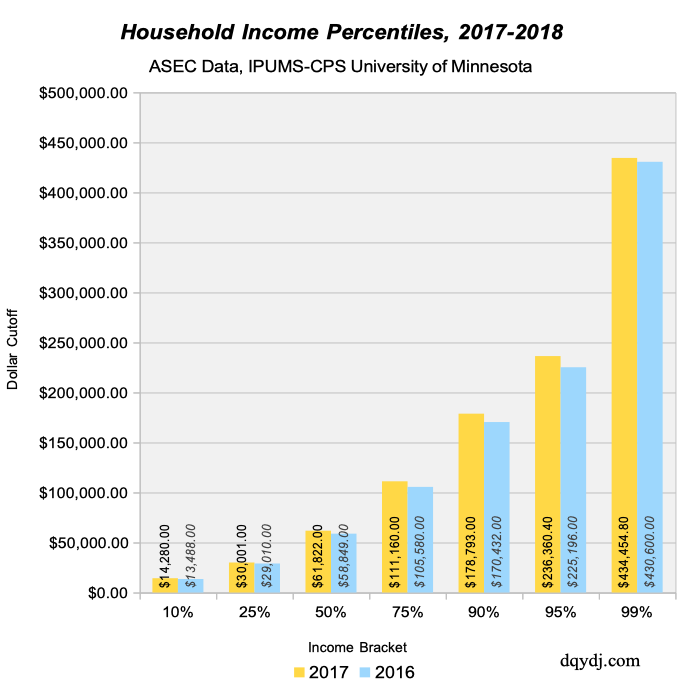 How did your household income compare to the US household income percentile distribution in 2018? Have you improved or declined relative to your position last year?